The observations that Darwin made during his famous trip in the Beagle established that species of life adapt over generations in order to match changing conditions in their environmental niches. However, the adaptation that he observed was limited. It was confined to the particular specie. For instance, he saw that birds adapted into birds of slightly different size, form and behaviour. He did not see birds adapting into dogs, cats or crocodiles. Transgenic adaptation has never been observed. Notwithstanding, most evolutionary scientists have, from such observations, extrapolated the principle of adaptation to establish a theory that supposedly ex­plains how the vast diversity of life that we see on our planet came to be. This stated, in essence, that all life evolved from simple to complex over millions of years under the influence of nothing more than the resident forces of nature. The basis of the theory is that life evolved from simple to complex, driven by nothing more than the fundamental laws of physics acting within the bare geometry of space-time. This theoretical process of evolution relies most tenuously upon concepts of chance and selection that I think should horrify mathematicians. Since antiquity, people have been aware of the complexity and diversity of life. They were awed by it. They speculated about how it could all have come to be. But they could never find a verifiable answer. So they speculated that it must have all been made by some unknown Supreme Creator. Many ancient civilizations, so historians would have us believe, speculated as to the form and nature of the Supreme Being that created all things. There were probably as many versions of this Supreme Creator as there were civilizations that speculated about his existence. Recorded within the Judeo-Christian Bible are accounts of purported instances of such a Supreme Creator - or at least, his messengers - holding direct conversations with, and giving detailed instructions to, a handful of specifically selected indiv­iduals. The obvious and unavoidable inconsistencies of the modern Biblical text show that whatever original message it may have contained has been diluted with error. Perhaps this resulted from mistranslation, misinterpretation or malicious creative editing. We cannot know. Whatever the case, the Biblical text claims to reveal what will or will not befall a person after death. A fearful notion, which kings and emperors quickly seized upon as a powerful tool for subjugating and controlling their people. Disobedience to an earthly king was met by physical armed force. This was something easily understood. It was something that could, eventually, be fought and overcome. But disobedience to an invisible Supreme God, who demanded obedience to earthly kings, was something that would purportedly precipitate eternal suffering after this earthly life was over. This was a power against which physical man could do nothing. It gave kings and emperors invincible leverage over their subjects, which organized religion perpetuated down through the ages. That is, until the Theory of Evolution came along. To many, especially academics, the Theory of Evolution appeared to alleviate the need for a Supreme Creator. The mask of deception, long maintained by organized religion, suddenly fell. Whatever political and economic prisons still bound the multitudes of the dispossessed, their minds at least were now free from the chains of fear with which religion had once bound their ancestors. But does this mean there is no God? If all that exists - including life on Earth - evolved from simple to complex under nothing more than the laws of physics, then there is no need for a creator of life. However, there is still a need for something or someone to create and sustain the laws of physics. On the other hand, if God created the world and all that is in it in 7 days, then most direct observations of physics must be in error. In other words, we cannot trust our eyes, our instruments or the formally discovered laws of physics. Using scientific theories or ancient texts to try to prove or disprove the existence of a Supreme Being does not interest me. If God exists and created all things, all well and good. If he doesn't exist then I see no point in trying to create him in my own image to alleviate my fear of eternal oblivion. I just want to examine what is scientifically and philosophically reasonable and what isn't. Perhaps life did evolve from simple to complex. Notwithstanding, I can't see how it could have possibly done so under the influence of nothing more than the laws of physics. If life did evolve from simple to complex, then some kind of additional active agent must have been involved. As I am given to understand, the simplest form of life that is currently known is the single-celled bacterium. Could the bacterium have spontaneously formed as a result of atoms and molecules randomly combining under nothing more than the passive forces of physical law? The problem with this idea is the vast leap in complexity illustrated by the diagram on the left. On the one hand, a molecule is simply a conglomeration of atoms, which may combine and separate according to the current cat­alytic conditions within their immed­iate environment under no more than the passive forces of physical law. On the other hand, even the simplest form of life needs to contain species-specific data and instructions on how to build and operate it. A life-form also needs to contain a biological mechanism to interpret and expedite the instructions held within it. How could nature achieve the enormous leap in struct­ural and functional complexity from the inanimate molecule to the program-driven bacterium? To investigate this, it is first necessary to look into an idea about the nature of space-time and some strange attractors that appear to be hidden therein. Side Note on Atoms and Molecules: As I understand it, there is a school of scientists who currently think as follows. At the ultimate (or most microscopic) scale, the fabric of space-time is a boiling foam of fundamental force-fields. Everything that exists is simply a manifestation of how this boiling foam crystallizes into larger stable configurations of standing waves. The stable configurations that are able to form are determined by the fundamental geometry of space-time. When sufficient external energy, in the form of a travelling wave, impacts with such a stable configuration, it becomes unstable. This causes it to transmute to a meta-stable configuration of higher energy. A meta-stable configuration may, spontaneously under the right catalytic conditions, lose energy by radiating a travelling wave. In this case, the configuration transmutes back to a stable lower-energy state. These fundamental particles can, under the right environmental condi­tions, combine to form larger composite structures called atoms. These, in turn, can interconnect to form molecules. Under very finely-tuned catalytic conditions, many different kinds of very large molecules like proteins can form. Furthermore, one kind of very large molecule can split and reconfigure into another kind of very large molecule, the direction of transmutation being determined by very slight variances in ambient conditions. It seems plausible to me that all these complex configurations of standing waves - from particles to organic molecules - can take form from funda­mental force fields acting within the bounds of the fundamental geometry of space-time. Indeed, one could reasonably speculate that the laws of physics are, in the ultimate analysis, simply the way the fundamental geometry of space-time manifests itself to human perception. This idea is based on the postulation that the laws of physics are simply an inevi­table consequence of the fundamental geometry of space-time. Consequently, it is not unreasonable to view atoms as being merely the result of fundamental forces convoluting themselves to relax into geometric symmetries that already exist within the basic dimensionality of space-time. As an aid to understanding, I liken the fundamental force-field to water. It has no specific shape or form. It is a fluid. 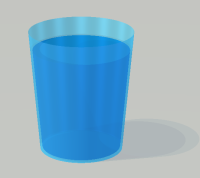 However, if you pour water into a beaker, it assumes the form or shape of the beaker. If you pour the water into a glass pipe in the form of a coil, then the water will assume the shape of the coiled pipe. Of course, the beaker and the coiled pipe are solid vessels made of glass. The dimensions of space-time, on the other hand, are immaterial and in­tangible. Furthermore, water will only behave this way under the influence of gravity. Suppose you squeeze some water out of a plastic bag while you are on a space station in orbit around the Earth. The water will striate all over the place, changing shape and form randomly. If you leave it for some time, however, it will gradually settle down into the form of a sphere. Once it had left the plastic bag and was floating in the air, somehow it was attracted towards this spherical shape. If you now squirt some mercury into the water, the mercury will eventually settle into a sphere that is concentric with the sphere of water. Something attracts the mercury and the water to relax into these concentric spheres. The attractor in this case is gravity, which, according to relativity theory, is simply a result of the way the mass of the water and the mercury deform space-time. The water and the mercury are made up of quarks (within the protons and neutrons) plus electrons. These are themselves, in effect, complex convolutions of the other primary force-fields. It seems, therefore, that space-time deforms and buckles according to a very specific geometry when subjected to what we perceive to be the various types of fundamental force. Furthermore, the precise pattern of this geometry seems to be self-evidently inevitable. The spheres of water and mercury above are in static equilibrium. They don't need to move in order to maintain their shapes and spatial relationship. Now, in order to include the time element of space-time, imagine that the sphere of water has within it two (somewhat smaller) blobs of mercury instead of just one big one. Also imagine that the whole thing is rotating. 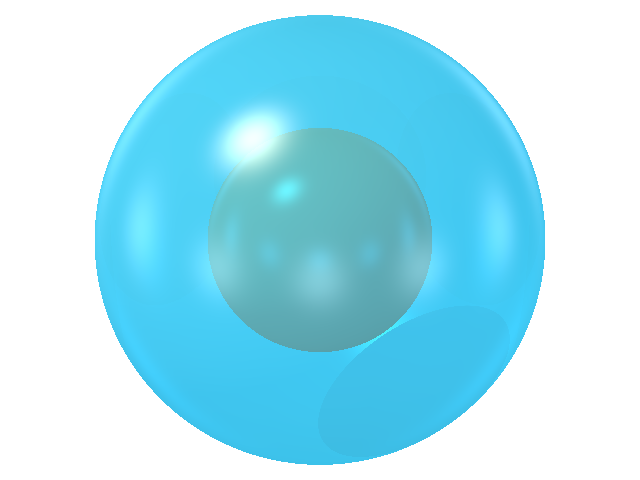 The water sphere elongates into a general ellipsoid. The two blobs of mercury become slightly egg-shaped and orbit each other around the common centre. This is a structure that is in dynamic equilibrium. It relies on its motion to preserve its form. A sphere is the one shape that has perfect point sym­metry. It is the same in every direction in 3 dimensions when viewed from its centre. However, when placed together with other identical spheres, certain subtle asymmetries (or imbalances) in the fundamental nature of space become apparent. Consider the cluster of spheres shown on the right. Assume they are attracted together by magnetism. The cluster com­prises a central red sphere enclosed completely by 12 green spheres. Each green sphere touches the central sphere plus 4 of its neighbours. 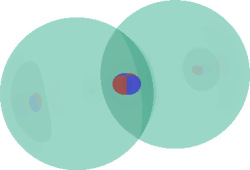 However, the green outer spheres do not fit together as snugly as one may imagine. The pattern of spheres that fit most snugly form triangles of spheres. In the above diagram, though, while some of the spheres form triangles, others form squares. The square arrangement has an over-sized gap in the middle that you wish you could close up by pushing two opposite spheres together to form a double triangle or diamond shape. Unfortunately, if you do this, a former triangle of spheres in another part of the cluster will open up to form a square. You are back where you started. The diagram on the left shows that a slightly different configuration of 13 touching spheres can exist. One group of 3 spheres has been rotated 60° to fall into the next slot round, so to speak. The upshot is that identical instances of the most symmetrical shape known cannot cluster together in 3-dimensional space to form a composite object that is perfectly symmetrical. Symmetrical space itself gives rise to subtle small asymmetries. 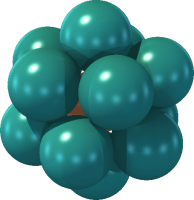 Notwithstanding, 12 spheres can be arranged around a central sphere so that they fit together snugly in triangles. This arrangement is shown on the right. Each green sphere touches the central sphere and 5 of its neighbours. However, there's a catch. The apparent perfect symmetry is subtly broken. This is because, for the outer spheres to fit together in this way, it is necessary that the central sphere be smaller than the others. Its radius must be only about 0.90211303 times the radius of the others. In reality this ratio is probably one of those strange irrational numbers that can never be exactly determined. It is clear, therefore, that 3-dimensional space cannot accommodate perfect point-symmetry. It almost can. There are nevertheless niggling little asymmetries that favour certain views and directions in preference to others, depending on the configuration of the objects involved. Furthermore, these niggling asymmetries are not arbitrary. They involve irrational numbers, which are far from regular and far from random. They are highly complex but are nonetheless intimately woven into the fundamental fabric of space. Of course, spheres - among many other shapes - fit together snugly in 2 of the 3 dimensions of space. Spheres, for example can form an infinite plane of spheres in which each touches 6 of its neighbours. This, however, always leaves the 3rd dimension at somewhat of a loose end. To bring the notion of time back into the discussion, if an object rotates, two of the spatial dimensions form the plane of rotation. In this they are perfectly symmetrical. However, this always relegates the 3rd dimension to a state of asymmetry with respect to the other two. There is nothing that intuitively seems more symmetrical than a lone sphere. Notwithstanding, even the sphere itself isn't completely symmetrical. Its inside is different from its outside. Inside it is a small finite space. Outside it is infinite space. The greatest distance you can go into a sphere is the short length of its radius to the point at its centre. The greatest distance you can go outside it is a theoretically infinite distance to the edge of the universe. This makes it extremely asymmetrical. It is abundantly evident that different genuses of life share common geometrical themes. 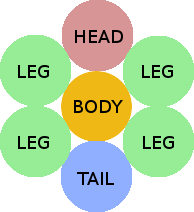 For example the almost universal configuration for higher animals is a central body surrounded by a head, a tail and four legs. Some cite this as evidence of a common evolutionary origin. Others cite it as evidence of a master designer. I think a stronger possibility for this common config­uration is that the hexagon is the most compact and robust shape for a 3-dimensional life-form that inhabits an essentially 2-dimensional planetary habitat. It is simply a direct fall-out from the fundamental geometry of space. Four legged animals walk and run in various ways. I think a horse has 4 modes of locomotion: walk, trot, canter, gallop. It may have others. I don't know. Never­theless, most of its modes of locomotion involve it having only two legs, or even only one leg, in contact with the ground at any instant. If it suddenly froze, it would fall over. In order for a 4-legged animal to move, its brain must execute intricate balancing procedures. This is even more so for the two-legged human. The human's cerebral balancing software is the most complex and advanced. Of course, there are insects that have 6 legs and spiders that have 8 legs. They have small brains that are not able to accommodate complex balancing software. Consequently, they can only walk without falling if they have at least 3-point contact with the ground at every instant. That is why they need at least 6 legs to form two alternative 3-legged tripods. I don't really know about spiders. Whatever the number or configuration of legs, it can sensibly be explained as the optimum way of implementing locomotion within a flat plain in 3-dimensional space with the biological resources available. Nevertheless, 4-legged locomotion offers more manoeuvrability and energy-efficiency than 6-legged locomotion. And 2-legged locomotion offers more manoeuvrability and energy-efficiency than 4-legged locomotion. So it pays to develop a larger brain and reduce one's number of legs. But does this mean that life itself is necessarily and sufficiently no more than an inevitable fall-out from the fundamental geometry of space? No. It is no more so than the design of a beautiful palace is the inevitable fall-out from the geometry of a brick. The structure of a palace contains representative information that is above and beyond that contained in the geometry of a brick. The geometry of a brick is simply a standard of consistency used by the designer of the palace for realizing his design efficiently. Likewise, whatever agency or mechanism constructed life, it naturally used the fundamental geometry of space as the most efficient way possible of realizing the structures of biological systems. On the other hand, I am convinced that the basic structure of matter, including those aspects of it from which life is built, definitely are an inevitable fall-out from the fundamental geometry of space and time. The dominant symmetries, together with the cheeky little asymmetries, of space-time form a complex mathematical attractor. It is as if the symmetries were the blank paper upon which the asymmetries inscribe the detail. Consequ­ently, it is pure geometry that gives the fabric of space-time no choice, under the right catalytic conditions, but to convolute itself into the forms that we perceive as the "particles", atoms and molecules that make up the material universe. The catalytic conditions necessary for the formation of the different types of atoms are extreme. The fabric of space-time will only snap into such microscopic convolutions under the extreme temperatures and pressures encountered in the centres of stars. However, once created, they latch into their respective forms so that when their maternal star no longer exists, they remain. Indeed, it takes an enormous impulse of energy to unravel them back into smooth space-time, in which case they release the far greater energy that their mother star originally crushed into them. 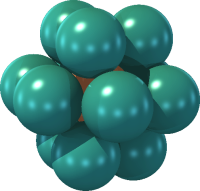 Very large atoms are radioactive. They eventually crack up into smaller atoms. Smaller atoms, however, are completely stable. These are the building bricks of all material objects. 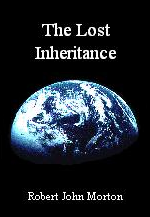 They can be neither created nor destroyed by conditions encountered within the Earth's biosphere. A few of these stable atom-types play key roles in the structure of life. 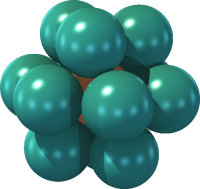 These atoms contain subtle structural asymmetries that enable them to link with other atoms to form composite structures called molecules. Atoms spontaneously combine into various kinds of molecules in events motivated by random external forces within their environments. Some of these events can be frequent, gentle and benign. Others can be rarer and more violent. Nevertheless, their effects are constrained by strong mathematical attractors that are defined by the fundamental geometry of space-time. These attractors impose a limit upon the nature, size and complexity of a molecule that can be generated by the passive forces of physical law. Events driven solely by these forces are somewhat analogous to throwing a pair of dice. Rand­omly, you can throw any number from 2 to 12. But you can never throw a 12,000,000. 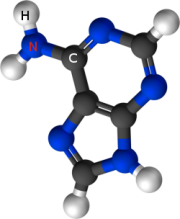 Small molecules that can be formed in this way have an upper size limit of about 1 nanometre. Protein molecules can be up to 10 nanometres. On the other hand, the DNA molecule of the bacterium comprises about 12 million base-pairs. One conversion ratio I have come across is that 100,000 base-pairs occupy about 34 nanometres. This puts the length of the bacterium's DNA molecule at over 4,000 nanometres or 4 microns. That is 400 times the size of the largest molecules that can form catalytically under nature's resident forces. The DNA molecule is not the bacterium. Neither is it a template within which the bacterium can be constructed. It is the equivalent of a set of written instructions on how to construct and operate the bacterium. And these instructions are written in a kind of symbolic language. Thus, its individual base-pairs have to be meticulously arranged in an exact order, according to the genetic information inscribed within it. It cannot be just made up of 12 million base-pairs randomly strung end to end. They must be arranged into an order that represents the equivalent of 3 million bytes of coherent information. The passive forces of physical law have no means of knowing or interpreting this symbolic language. Foreknowledge of the language, and how to interpret and expedite it, must be somehow built into the bacterium. The passive forces of physical law therefore could never randomly produce a complete working bact­erium - the simplest form of what can be truly called life. To make the leap between the largest molecules that can form under nature's resident forces and the bacterium, we must bridge two enormous chasms. The first chasm we must cross is this. We must find a way to construct gigantic DNA molecules and other cellular sub-structures where no such molecules or structures existed before. In other words, we can't simply copy them catalytically as happens inside the living cell. We must create them from first principles. And the DNA molecules we create must form data storage media that are inherently error-free. The second chasm we must cross is the language barrier. We must invent a language in which to express the structures and procedures for building and operating the necessary components and sub-systems of the bacterium in terms of molecular symbols that bear no physical resemblance to what they represent. And this language must be universal and consistent over billions of years. Evolutionists bridge these two chasms by theorizing as follows. Once upon a time, under favourable catalytic conditions, atoms of carbon, nitrogen, hydrogen etc. combined with each other to form the DNA bases and all the other chemical sub-assemblies needed to form a generic living cell. Over millions if not billions of years, these chemical sub-assemblies combined here and there, split up again, recombined differently and so on. As time passed, these chemical sub-assemblies became larger and larger. Eventually, by remote chance events, these large sub-assemblies all snapped together to form a super-assembly of the size and complexity of a living cell. Sadly, of the zillions of times this happened, these super-assemblies were all completely useless. Then finally, after quadrillions of attempts, one super-assembly materialized that constituted a generic living cell. Unfortunately, although the DNA it contained was of an appropriate size, its base-pair sequence was just blank tape. It contained no meaningful information about the structures and procedures that had to be followed in order to replicate the cell. The cell could not therefore split to form two copies of itself. Eventually, it died and decomposed back to its molecular components. Ultimately, after even this had taken place quadrillions of times, a cell was formed that contained a fully and correctly programmed DNA molecule. Somehow, by blind chance, all the 12,000,000 base-pairs of the DNA had assembled themselves into a coded message that specified how the very cell itself could be built and operated. Furthermore, a mechanism within the cell that interpreted the coded instructions happened to interpret them in the same language as that into which all the base-pairs had randomly sequenced themselves. The first living cell was born. There are two problems with the above scenario. Firstly, many say that the number of elemental operations required to create a generic living cell by this method would be way beyond astronomical. In other words, it would require many times the number of operations than the number of Planck intervals that could possibly have elapsed since the birth of the universe. Since no physical operation can take place in less time than a Planck interval, this would be clearly impossible. The calculation that people use to try to substantiate this idea goes something like as follows. <= 1 in 4.29184549 * 1039857. Consequently, these proteins could not come into existence by chance. The second problem is that, in any case, all such operations would be bound by the limits imposed by the mathematical attractors that are defined by the fundamental geometry of space-time. The necessary and sufficient chance events would thereby be prohibited. They could never take place anyway. Consequently, it must be fairly safe to assert that the recipe for life could not possibly have originated in this way. Nevertheless, life exists. The first living cell and the DNA code must have come about somehow. So from whence did the structural and procedural information-content carried within the DNA molecule come? From whence came the cellular mechanisms that interpret and expedite it? Who or what formulated the vocabulary and grammar of the language in which it is encoded? It is necessary to investigate other ideas. The ultimate dimensionality of space-time isn't really known. So perhaps its fundamental geometry is much deeper and more complex than is required merely to form primary particles, atoms and molecules. I have heard that a Monster of Symmetry exists within a 26-dimensional virtual space-time pondered by certain mathematicians. Perhaps this could be the template or jig within which the fundamental forces of nature would have no choice but to eventually, somewhere, under the right catalytic conditions, crystallize into a generic living cell with a complete Gaian genome inscribed within its DNA. If this were true, then the complete design for life must be embedded within the fabric of space-time. Through some pivotal event, this vast plethora of organ­ized information must then have been cast into material form as the first generic living cell. Unfortunately, there are two catastrophic flaws in this idea. Firstly, any Monster of Symmetry that may inhabit the multiple dimensionality of space-time, however complex, can only impart structure. It cannot act as a template for a machine. It cannot impart functionality. On the other hand, although the living cell is a biological structure, it is also a machine. It contains functionality that pertains to something beyond itself. Secondly, functionality involves the following of a stored procedure. A procedure comprises actions. These actions must be recorded in the form of representative structures. This requires abstraction, which necessitates some form of coding convention or language. Abstraction and language are nowhere found in the universe of forces, particles, atoms and molecules. Neither do they form part of the geometry of space-time. To suggest that the grand design for life is somehow inherent within the geometry of space-time is like suggesting that the words of a book are inherent within the fabric of the paper. But even more so, it is like saying that the meaning carried by the words is inherent within the fabric of the paper. The emotions expressed in a great classical poem come exclusively from the mind of the poet. The paper is a physical medium that carries only a symbolic representation in the form of words and combinations of words written upon it by the poet. The medium is not the content. Neither is the written word. A person reading the poem can understand and feel what the poet intended only because he has the inherent power to interpret the meaning that the written symbols represent. Without interpretation, the words are just black shapes on white paper. In any case, this idea simply pushes the source of the genomic program a step back from the DNA molecule to the more fundamental fabric of space-time. It does not get rid of the absolute necessity for a pre-existing program of immense complexity and information content. One is left with what is effectively the same question. Who or what programmed this intelligence into the fabric of space-time? I think therefore that the design for life must have been encoded, in symbolic form, directly into the living cell. Correspondingly, the idea of life must have pre-existed the component molecular structures that underpin its existence. If not, it would seem statistically doubtful to me whether such means could, so neatly and precisely, fulfil their end. A structure has no significance outside itself other than that it may have a form that enables it to connect to other structures. A structure does not have to be static. It can be oscillatory, for example, alternating to and fro between two extremities of shape. Atoms are structures. The fundamental asymmetries in space-time give atoms a valency which enables them to link with other atoms to form more complex structures called molecules. But even molecules are still only structures. A machine contains inherent functionality that can have significance beyond its own form and motion. It is made up of a process that acts upon an input to produce an output. The process needs to be driven by a program. The program is held within a medium, which is composed of structures that represent both actions and other structures. A machine's input can be raw materials (basic structures), signals (information carriers) or both. Its output can be intentional (purpose-specific) structures, signals or both. Consequences of a machine's process can be that the machine grows in size and/or adapts its form and/or function. A cell is a machine. A generic cell takes in raw molecules of the appropriate kinds (inputs). It then processes these molecules into more complex molecules that it needs for specific purposes. Finally, it outputs (ejects or excretes) other "exhaust" molecules that are the unneeded by-products of its process. It uses newly produced purpose-specific molecules to build, repair, extend or adapt its own structure. Some of the cell's inputs are molecular messengers that carry signals about such things as the condition of the cell's environment and the types and states of other cells in its vicinity. The cell's internal process may, as a result of receiving such a chemical signal, output another chemical signal to advise other cells of its type, current internal state and perhaps even its imminent intention to change its type or state. A cell must receive regular input signals from other cells. If it doesn't, it terminates itself. In other words, if it doesn't hear from its neighbours, it commits suicide. A cell also has an internal life-span clock. When this runs out, the cell also terminates itself. It can therefore no longer send signals to other cells and so they too will soon terminate. This is what determines the life-span of its host life-form and coordinates its final shut-down. The cell's function is not merely to grow, transform, adapt and preserve itself. It fulfils a higher purpose. For example, the destiny of one particular generic cell within an embryonic human may be to become an active element within an eye. To fulfil this purpose, the program that controls the process within the cell proceeds as follows. It receives signals from its environment. These indicate that it is in the vicinity of where the retina of an eye should form. It selects the inputs necessary to adapt itself into a retina cell. It processes these into the components it needs in order to effect its adaptation. It carries out the self-adaptation. It then signals its state to its neighbours. Finally, it commences operation by switching in the operational procedures within its program. It then receives input in the form of light. Every time it receives light input, it outputs a corresponding chemical signal to an adjacent optic nerve cell. For this all to work, the program within the cell must orchestrate the role that the cell plays within the whole of the human life-form. The program must therefore take into account the entire human being and the environment within which that human being operates. Hence, it must include a working know­ledge of Gaia also. However, knowledge about the big picture of the human being and its Gaian environment is not enough to enable the cell to play its designated role. Its program must include procedures on how to expedite its particular role within the context of the human being and its Gaian environment. How to expedite its role is not inherent within knowledge about itself, its host human or its human's Gaian environment. It is something beyond them. How to make a table is not inherent within the fibres of the wood. It is something above and beyond, which is solely within the mind of the carpenter. The Monster of Symmetry is simply a virtual structure. It is not a machine with specialized components and subsystems that all work together to fulfil a higher purpose. It therefore contains no systematic information. Consequently, it cannot act as an attractor or template that is able to impart systematic information (or programmed procedures) to a generic living cell. The second catastrophic flaw in the idea that the design for life is somehow embedded within the dimensionality of space-time is as follows. 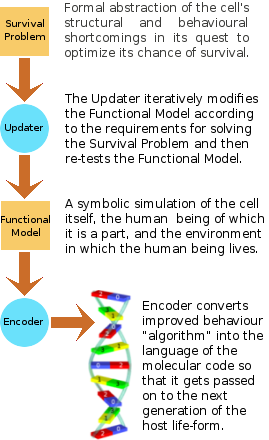 At least part of the cell's functionality is in the form of a program that is stored as a sequence of molecular symbols. Some of the molecular symbols represent structures that pertain both to the functional units of the cell and to the human being beyond. Others represent actions. These actions are organized to take place in sequence to form a procedure. The molecular symbols themselves bear no physical or analogical resemblance to the cellular structures or procedural actions that they represent. Just as neither the written word "human" nor its spoken sound bear any resemblance to the physical life-form that the written word and the spoken sound represent. A symbol and the reality it represents are related solely by what I can only describe as a convention. It is as if such and such an arrangement of molecules is deemed to be a command to a particular subsystem of the cell to expedite a particular process in a particular way. I know of no process, within the atomic and molecular world of physics, that involves one thing being deemed to represent another. There is certainly no instance, to my knowledge, in which a structure is deemed to represent an action. In other words, the phenomenon of language does not exist in the world of atoms and molecules. Neither is it seen to exist within the ultimate geometry of space-time. Mathematicians use symbols and operators to represent the structures and relationships within the geometry of space-time. However, the abstract symbolic representations are in the minds of the mathematicians. They are not part of the nature of space-time itself. On the other hand, abstract symbolic representation does exist in the living cell. Information that is symbolically represented by a certain sequence of chemical bases determines, for instance, the colour of the iris of a human eye. The information encoded within the DNA molecule of a living cell does not so much pertain to the cell itself, but to the human being of which the cell is but a minute part. The cell therefore contains a symbolically encoded model of the form and function of a super-system that is completely different from itself and 15 orders of magnitude bigger. So, between the molecule and the living cell, there are not just the giant leaps of scale and complexity. There appears the completely new phenomenon of abstract symbolic representation, which is nowhere found in the world of molecules, atoms, particles, forces and the geometry of space-time. The forms and behaviours of particles, atoms and molecules are governed by what we call the Laws of Physics, which are themselves probably manifestations of force fields convoluted by the fundamental geometry of space-time. Hence, a particle, atom or molecule is simply a passive voyager in an ocean. It has no power of self-determination to modify or control its course or destiny. The living cell, however, determines not only its own destiny but also the structure and behaviour of the vast life-form of which it makes itself a part. It could never achieve this by passively drifting with the forces of nature. It has to deliberately execute an internal symbolically-encoded program. A special-purpose machine, such as an old-fashioned spin-wheel or pendulum clock, has a fixed behaviour. It works according to a fixed program. Its program is effectively built into its physical structure. Charles Babbage's analytical engine (the very first computer) was of this kind. To change its program, he would have had to redesign and rebuild the physical machine. His friend Ada Lovelace had the idea of abstracting the special-purpose behaviour from the physical machine. A general-purpose machine could then be made that could be controlled by any of many different special-purpose programs. To change what the machine did, it was necessary only to feed in a new program. There was no need to rebuild the physical machine. The special-purpose program is stored in the symbolic form of a programming language. This is interpreted and executed by the general-purpose machine to effect the intended special purpose. The living cell probably contains func­tional subsystems of both these kinds. The fixed behav­iour special-purpose kind is suitable for sub­systems whose functions never change. The general-purpose kind, that is driven by a flexible special-purpose pro­gram, is suitable for subsystems whose functions may need to adapt to changing environmental conditions. I get the impression that many biologists believe that all the programming within the living cell is stored in the DNA molecule. However, I find this difficult to believe. The human genome contains at most only the equivalent of 750 MB (megabytes) of information. On the other hand, the Microsoft Windows Vista operating system (circa 2009) occupies up to 15 GB (gigabytes). In other words, it is 20 times the size of the program that orchestrates the construction and operation of a conscious human being. As I have explained in detail elsewhere, that, to my mind, doesn't add up. This is why I think that the vast majority of the programming in a living cell cannot reside in the DNA. I think it has to be distributed throughout the cell, each part being embedded within the cellular subunit to which it pertains. Some may be embedded within the structure of its subunit, as with a watch or a car engine. The rest may be embedded within its respective subunits, but symbolically-encoded on separate media, as with a computer. 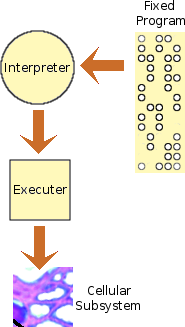 In this case, the cellular subunit must include a mechanism for interpreting and executing the encoded program. Perhaps the reality of how a functional subunit of a cell works is neither of the above, but a hybrid of both. Either way, I think that the embedded programming that is distributed throughout the cell's subunits is what powers the construction and operation of the generic human life-form. However, there is something vital that I think this programming does not contain. I don't think it contains the programming necessary to individualize each human being to make him or her unique among the 7,000 million others that currently inhabit this planet. I think this is the job of DNA. When I open a Unix terminal on my computer, I am able to enter the name of a program to run. The program itself can be vast, performing an extremely large and complex task. However, I also have an option to individualize the way I run the program this time. To do this, I type-in some arguments or parameters on the command line after the name of the program. If the individualizing parameters I wish to enter are themselves quite long and complicated, I can write them into a text file. I can then just write the name of the file on the command line after the name of the program I wish to run. The program will then get all the individualizing parameters from the text file. 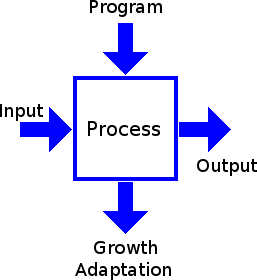 In the following diagram, I use the Unix command to try to illustrate my view of the functionality that is programmed into the living cell. The main program being executed here is called mgh, which stands for "make a generic human". This represents the vast functionality that is distributed among the various subsystems of the cell. This is followed by various arguments that individualize the particular instance of the human life-form that is being generated this time. These specify that this particular individual will grow up to have blue eyes, jug ears and a button nose. These individualizing arguments are stored as genes within the cell's DNA molecule. The main program, mgh, uses the given arguments to guide its construction procedures to generate an individual with the specified characteristics. It seems more credible to me that DNA be the cell's "text file" that contains the arguments or parameters that individualize each instance of human life. I think the interpreter within each subunit must read its respective part of the DNA as its "command-line" parameters. Intuitively, I think that the specification of the variety among individuals that exists within the current population of this planet can be well accommodated within the human DNA's 750 megabytes. Of course, the Unix command is only a very loose analogy. I don't think a cell operates like a computer program. It is obviously far more sophisticated. Nevertheless, I think it is a useful aid in trying to probe the principles involved in the structure and operation of the living cell. The living cell is a structure. It is made up of molecules, which are combinations of atoms, which are combinations of particles, which are convolutions of force-fields shaped by the symmetries and asymmetries within the geometry of space-time. But the cell is also a machine. It expedites a function that pertains to the const­ruction and operation of a life-form, that is 15 orders of magnitude larger than itself, and the even vaster Gaian environment within which that life-form is immersed. The cell's functionality necessitates the presence of embedded programming. This in turn necessitates the use of functional abstraction and symbolic representation and interpretation according to a consistent convention or coding language. None of these concepts, nor any elements from which they could be constructed, appear to be anywhere present within the material world of molecules, atoms, particles, forces or the geometry of space-time. Consequently, the inherent intelli­gence, according to which the living cell is constructed and operates, cannot have come from the elements of which it is made or the space within which it exists and operates. The living cell contains a vast amount of what can be termed intelligence. It contains a vast coded program of structural and procedural information about how to construct and operate itself and fulfil its higher role as part of a vast life-form. It contains mechanisms for interpreting and executing that coded program. It can switch in and out various parts of its program in response to prevailing environmental conditions. It can select or deselect parts of its program according to seemingly random criteria. It can copy itself and its coded program. Notwithstanding, as far as can be observed, the living cell has no formal mech­anism for originating, abstracting and encoding new structural and procedural information. So it can never add to its internal programming. But is it possible? Could the intelligence within the living cell, by some other means, have gradually accumulated in infinitesimally small steps over a vast duration of time? Consider what a cell would have to do in order to augment (modify or add to) its internal programming in order to increase its host life-form's systematic complexity, and hence its chances of survival and betterment within the Gaian environment. First of all, the cell must sense what is taking place within the whole body of the host human of which it is a part. It must also tap into its host's main senses to find out how its host human is interacting with his Gaian environment. 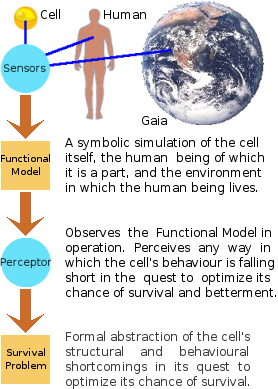 The cell must then construct an abstract functional model that simulates its own internal workings, the workings of the human super-system of which it is a part and the Gaian environ­ment within which its host human is living and interacting. The cell must then observe and consider the functional model in order to devise a way of modifying its host's behaviour that will improve his ecological efficiency, guarantee his survival and facili­tate his long-term development. The cell must then somehow express this plan for improvement in the standard symbolic language of molecular encoding. From the formal specification of the Survival Problem the cell must now devise a solution. It must work out how to modify the structure and behaviour of its host human in order to solve the Survival Problem and improve its host's propensity for survival and long-term betterment. It must then test this solution by modifying the Functional Model and then observing the model again to see if the changes in its host's structure and behaviour produce the desired effect. It must repeat the process of modifying and testing until the model verifies that an optimal solution has been reached. Finally, the cell must encode the modified model in the form of molecular symbols on to the recording medium used by the cell to preserve its structural and pro­cedural information. 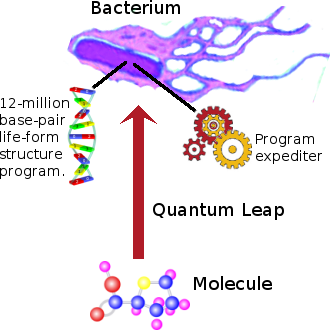 In the diagram on the right, I have used my DNA model to repre­sent the cell's recording medium. However, as I said earlier, I think that the majority of this information is distributed, being embed­ded within the cell's various subsystems. 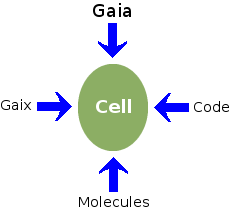 For a cell to make even the slightest addition to its internal programming, it would need to observe the outside world, abstract a symbolic model of it, run this as a free-standing simulation, make systems analytical judgements as to how it could be augmented to better meet its survival and development objectives, and finally record the results in the abstract form of a symbolic language. To be able to do this, the cell would need extensive higher-animal sensory systems and a brain containing a mind that possessed the power of abstract thought and knowledge of symbolic language. Clearly, the generic human cell does not have these. Neither does the bacterium or the amoeba. So, is there another option? A life-form, such as a human, cannot be adapted by modifying it from the outside. Nature cannot blindly bolt on an extra limb or finger. It won't integrate functionally and it won't be reproduced in the next generation of the life-form. The only way to adapt a life-form is to constructively modify the internal programming of its cells. But how could this take place? One way that people suggest is as follows. Cosmic rays hit the molecules that make up the storage medium that holds the structural and procedural information that orchestrates the construction, operation and reproduction of the cell. This effectively changes the cell's internal program. The molecules of the cell's information storage medium can also be attacked by chemicals. Either way, the result is that some aspect of the cell's internal program is destroyed. Its semantic information content is consequently reduced. Clearly, therefore, the complexity of the cell's structure and functionality can never be increased in this way. Some people suggest that such damage may improve or advance the functionality encoded within a cell. On this basis, if I arranged for random bits to be bombed out of the operating system of my computer over millions of years, perhaps its performance will improve. I think not. Randomly altering or adding bits or bytes to the 1980s DOS 3.1 PC operating system will never cause it to spontaneously transmute into Windows Vista. Neither will such a process achieve this in zillions of infinitesimally small steps over billions of years. Such a goal is simply beyond the bounds of the mathematical attractor within which such a process is constrained to operate. It is like firing the full 9 yards of ammunition from a World War II ·50 calibre aircraft machine gun at a 1948 model Volkswagen Beetle. This will never create a 2009 Toyota Land Cruiser with computerized engine management and satellite navigation; no matter how many millions, billions, zillions or quadrillions of times you try. Likewise, randomly hitting a complex molecule with cosmic rays can never be constructive. The very idea violates the most fundamental laws of physics. Yet for this view of the evolution of life to work, this is what, in principle, must take place. Consider the following scenario. One fine day, a cosmic ray hits an atom of a molecule that is part of the information storage medium of a cell within the body of an ant. In the vast majority of cases, this results in the information becoming totally dysfunctional. But once in every quadrillion times it causes the molecules to reconnect into an ever so slightly more complex program. Over billions of years, this process repeats many times until many new molecules become randomly included within the internal programming of the ant's cell to form impeccable additional code. Eventually, the programming within the ant's cells contains all the instructions for constructing a new more advance life-form. Its brain includes new software for balance-controlled locomotion. It also suppresses the growth of two of the life-form's 6 legs. Over the next few billion years, successive generations are more successful and therefore become bigger and bigger until some evolve into cats and others into dogs. Some evolve into cogs and dats. But sadly, these are biologically dysfunctional and so die out without leaving any trace within the fossil record. I think not. Below is a snippet of Java code from a global navigation program that I wrote. If I were to randomly change any character within the Java code here, the entire navigation program would become dysfunctional. The unmanned air vehicle it was navigating would undoubtedly crash and be destroyed. If, by chance, the program still worked after a fashion, its functionality could not be other than inferior to the original.
} // bearing line from previous waypoint. Of course, nature is a more able and sophisticated programmer than I am. It has undoubtedly built redundancy and self-repair facilities into the cell's systems. Nevertheless, the best the cell can do with these is to repair what was destroyed. It does not have means to improve or extend its internal programming. If the species of life evolved from simple to complex by the random destruction of the cell's internal programming, then the fossil record would be littered with inferior chimeras that could never survive the long-term. So this cannot be what gave rise to the plethora of species we see in the world. Bombing the main software won't work. But what happens if we randomly bomb the main software's command-line arguments instead? As I said earlier, I believe that the main software of the cell is distributed, each subsystem having its own respective functionality embedded within it. And I believe that the limited information storage of the DNA molecule con­tains only the individualizing information for each instance of a particular specie. If this be so, then randomly bombing a specie's DNA will not necessarily result in dysfunctional progeny. It may not even result in infer­ior progeny. Notwithstanding, it still cannot result in superior progeny. Most computer programs contain validation procedures. These check the validity of command-line arguments. They ensure that any presented argument that is outside the permitted range or makes no logical sense is either ignored or defaults to a value that can cause no harm. I expect that the main program of a living cell has such safety features built in. Any that didn't would not survive for very long. This means that a damaged gene within the cell's DNA generally could not cause the cell to generate a dysfunctional life-form. Unfortunately, this is not foolproof. Sometimes the main program within a cell goes wild and starts reproducing cells that are not fit for their intended purpose. Notwithstanding all this, the damage to the information carry­ing media within the cell can never produce a constructive extension to what is already there. The only possibilities allowed by the Laws of Physics are for the cell's internal programming to remain at the same complexity (shown in blue in the adjacent diagram) or to deteriorate (as shown in yellow in the adjacent diagram). My intuition is that the generic cell's internal program follows the blue. It maintains its complexity. I think the cell contains sufficient information integrity pro­tection to ensure the intact survival of the whole of its internal programming. Consequently, no matter how many cosmic rays hit however many DNA molecules over however many zillions of years, they cannot add so much as one bit of semantic information content to the cell's internal program. This leaves natural selection with nothing better to select. It can only ever select something as complex as existed before or something less complex than existed before. Randomly provoked blind change, with or without the aid of natural selection, is astronomically unlikely to adapt the specie constructively. It therefore cannot be the driver of simple to complex evolution. So, is there another possibility? What kind of mechanism could possibly create, add to or constructively modify the coherent information-content of a DNA molecule and other program-bearing media within the living cell? Such a mechanism is vital for life to be able to spontaneously come into existence and evolve from simple to complex. And this mechanism must already exist before life can begin. First of all, this mechanism cannot be in the cell's own information storage medium. That is simply the carrier of the "written" structures and procedures for constructing and operating its respective specie of life. It contains no active executive. Therefore it cannot develop or extend itself. It cannot expand the organized intelligence within it. It can never improve. It can only remain the same or deteriorate. It must be read and executed by an external mechanism. This mechanism must then be able to break down complex molecules and reassemble their parts into other molecules from which to construct and sustain the life-form. The simplest free-standing mechanism that can do all this is the complete cell. Perhaps the cell contains a mechanism that can cause different stretches of its DNA programming to become switched in or out in response to changes taking place in its niche environment over generations. But does it contain a mechanism that can actually extend the structural or procedural content of its internal programming? In other words, does it have a mechanism that can originate meaningful and relevant DNA-type coding? A specie receives information on how its niche environment is changing. This arrives via its various senses. However, this information does not contain details of how the specie itself must respond in order to best survive. Environmental conditions are not, in themselves, instructions on how to respond to them. There needs to be some kind of intervening programming that interprets or transforms the environmental conditions and their rates of change into appropriate adaptive responses. Example: A flight control program may receive sensory input indicating that the air vehicle is slipping downwards towards its centre of turn. Its response must be either to increase thrust or reduce bank. But the information that it is slipping does not tell it this. How to respond to this situation must already exist within its flight control program. The flight control program could contain routines that monitor how well or badly the air vehicle handles slipping in general as it encounters varying air densities during flight. But, there again, this information is not of itself a procedure on how to improve its slip handling. If the next generation of the air vehicle is to have improved slip handling, the reprogramming of its flight control system must be done by human programmers. The air vehicle's computers, by themselves, cannot add new functionality to its flight control program. It would seem that even a lower life-form, such as a bacterium, has the ability to switch on or off various characteristics of its form and functionality in response to changes in niche conditions. But it does not contain any mechanism for extending or improving its form or functionality. Besides, any such mechanism would have to "know" the DNA coding language. It would have to know which base-sequence represented which biological characteristic or function. How and from where could it get this conventional knowledge? Could there be mechanisms within the human brain that can originate or reconfigure genes within the host's DNA or add to the programmed functionality of its cellular subsystems? Construction and adaptation of the body (including the brain) across generations is not the brain's function. The brain's function is to control bodily processes and to map and respond to its host's environment during the life of the individual. Consequently, one cannot, by taking thought, add to one's height. Neither by so doing can one add to the height of his progeny. So it would seem that there is no intelligent "DNA programmer" resident within the living cell that can originate and implement constructive responses to changing Gaian conditions. Physical law alone does not have the wherewithal to orchestrate the construction, operation and reproduction of life. These tasks require the very profound and complex software that is embedded within each living cell. This software is undoubtedly distributed among the respective cellular subsystems that it controls. It is probably quite different from the software that runs in a computer. It is probably massively parallel, being structured according to some kind of archi­tecture that is a hybrid between digital and analogue. Most of it is probably hard-wired into the subsystems that it controls. Nevertheless, it is evident that at least some of the cell's functions are controlled by parameters that are coded into the cell's DNA molecule. To give it a familiar identity, I refer to the whole of the embedded software that controls the operation of the living cell as Gaix. By convention, I pronounce it Guy-ix. Also by convention, you can pronounce it Gay-ix if you wish. Its pronunciation is purely a matter of convention. It is not inflexibly determined by the Laws of Physics. I call the cell's software Gaix for two reasons. Firstly, because I think of it as the cell's operating system. (And the names of all good operating systems end with x.) Secondly, it must necessarily include functionality that pertains not only to the cell itself and the host life-form of which it is a minute part, but also to the vast Gaian environment within which its host life-form lives and operates. This is somewhat analogous to the way a motorist must have knowledge not only on how to drive a car technically, but also on how to navigate it along the streets and highways according to the traffic rules and must also have a mental road map of where he is going. Clearly, if life evolved from simple to complex, then it had to do so under program control. And the only program that controls the construction and operation of life is Gaix. Unlike a computer operating system, Gaix cannot receive on-line updates as new hardware becomes available. If it could, it would have to receive them from some kind of celestial server through a trans-dimensional sub-space channel. However, since I am not trying to write science fantasy here I'll discount this idea. Consequently, since Gaix fundamentally has no internal capability to extend its own functionality, Gaix must have existed, in its entirety, from the beginning. This being the case, there must have existed some initial generic cell with all the programming necessary to furnish all the functionality of all the different cell-types of all the different species that have ever existed within the Gaian system. Gaix must therefore be the operating system for Gaia as a whole. This does not mean that every specie that has ever existed had to be specifically pre-programmed into Gaix. The diverse variety in species could have been generated as a result of small differences in the initial conditions presented to Gaix within different embryonic cells. The generic living cell, builds and sustains itself by assembling large molecular structures that cannot self-assemble under the resident forces of natural law. The cell's functional objective pertains to a host life-form that has a structure and function beyond, and very different from, that of the cell itself. The cell individualizes itself from coded gen­etic information. It thus has to interpret the sym­bolic language of its DNA, which is necessarily a matter of convention and not a part or conse­quence of natural law. All this can only be orch­estrated by a complex cellular operating system that I have named Gaix. 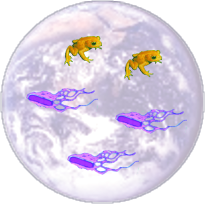 Starting with an initial living cell placed within the Gaian environment with its Gaix operating system installed and booted, it is easy to see how the diverse species of life could have unfolded. Gaix would simply switch and adapt its mode of operation in response to local environmental conditions and stored criteria. If it really did happen this way, I would imagine that the diversification of genuses would occur extremely rapidly. From then on, each genus would diversify into species in order to tune themselves to different niche conditions at different times and in different places. This latter process would be on-going, with a somewhat chaotic oscillatory behaviour. The size of a specie's DNA molecule appears to bear no simple relation to the size or complexity of the life-form to which it pertains. For example, the DNA of the single-celled Polychaos Dubium comprises about 670,000,000,000 base-pairs. That is equivalent to 78GiB of RAM or 84GB on a hard drive. It is over 230 times the size of human DNA. There are many other examples of this kind of size inversion anomaly. One could argue that perhaps the Polychaos Dubium's DNA contains a lot of excess "blank tape" that carries no meaningful genetic information. But what motive could nature have for constructing such an oversized DNA molecule in the first place? There is no reason to increase the size of the DNA molecule if it is not going to carry essential code. It seems more likely that the DNA of Polychaos Dubium contains 230 times the amount of Gaix command line arguments than does human DNA. In other words, Polychaos Dubium has 230 times the amount of individualizing information. This would seem to bestow upon it an enormously greater potential for diversification. Perhaps the first operational living cell was something similar. It would have had a very large DNA that contained all the individualizing parameters to drive Gaix into generating any one of the vast diversity of future species. Perhaps the DNA of the ancient and simple Polychaos Dubium is Gaia's backup in which the entirety of the original full implementation of Gaix is stored and preserved. If so, it contains all the genetic information that was contained in the ancestor of all forms of life that exist today. How each genus then developed from this would have been determined by Gaix's built-in response to the genus's ambient environment within Gaia. This is analogous to the way generic cells form into different kinds (species) of specialized cells in the human body. Each generic cell contains the whole of the human version of Gaix. However, which part of this Gaix a particular instance of the generic cell executes depends on its immediate environment. This determines which kind (specie) of specialized cell the generic cell becomes. Some generic cells thus become brain cells, some become skin cells and so on. Of course, this process of shedding unrequired code would have to be strictly controlled. Gaix would have to contain procedures that only allowed the shedding of code that would not be required by the genus that contained it, nor by any of the species that would eventually branch from it. Hence, the DNA of the Initial Cell would contain logic inhibiting the shedding of any genetic information. All would be required by its future derivatives. Later genuses would have less future branching to do. They would therefore be able to shed more unrequired code. A myriad varieties of life - from very simple to very complex - exist today. In other words, they coexist in parallel. If the complex emerged from the simple, then while some simple life-forms became complex, others remained simple in order to con­tinue to fulfil their basic essential roles within the Gaian system. 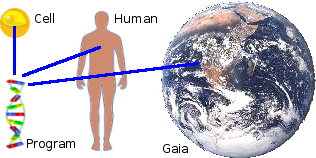 The complex relationships between the genuses of Gaia suggest that this vast variety of both simple and complex life-forms need to coexist in parallel in order for Gaia to function. For this reason, perhaps life emerged in what must have been much more of a massively parallel process. In this idea, the initial cell reproduces until there is quite a large number of them. Some then switch into a more specialized mode of operation that takes them along a path of development towards a particular genus. These then send out chemical signals revealing which mode they have switched into. Other cells that have not yet switched then respond by switching in like manner so as to maintain a prescribed ideal Gaian mix of genuses. An Initial Cell cannot simply grow and divide to become a human being. A cell that grows and divides until it becomes a human needs the facilities of a human womb. So does the monkey, cat and dog. Cells that become other life-forms need to have an egg-producing mechanism, and so on. This suggests that there must have been some intermediate stages that are not present in the current configuration of Gaia. Alternatively, the first complete life-form of each genus could have been grown under "laboratory" conditions. The problem here is that this would require a "laboratory" and a "laboratory tech­nician". So there are feasible options for the way life could have developed once an Initial Cell existed. But how did the Initial Cell get built? And who wrote Gaix? How did nature transcend the gap in complexity between the largest naturally-occurring molecule and the smallest living cell? I have heard some liken jumping the gap from molecule to living cell to scaling a mountain. They say that the leap in complexity and functionality can be achieved in a very large number of very small steps. By taking one small step at a time, the summit of the mountain is eventually reached. The problem with this analogy is that there is no mountain to step on. The mountain is imaginary. There is nothing. It is a void. It is like trying to climb to the moon one small step at a time. Each step you took would land you back on the ground where you started. There is no ladder to the moon. There is nothing to motivate large ordinary molecules to connect together until they form a living cell. The natural forces and the laws that govern them do not contain the necessary intelligence. Even if they could, it would be no use simply connecting molecules together to form some arbitrary large structure. They would have to be connected together in a special way so as to form a functional machine. Furthermore, the functionality of the machine would have to be able to orchestrate much more than the construction, operation and reproduction of the machine (cell) itself. It would have to orchestrate also the construction, operation and repro­duction of the host life-form within its Gaian environment. The resident forces of nature alone therefore could not have constructed the first operational living cell. Neither could they be the author of Gaix. So are there any other ideas as to how the first living operational cell could have come into being? The only certainty that is known about the living cell, and the complex functionality within it, is that it exists now. It can be reasonably assumed that it did not always exist. It is unlikely to have been an original component of a steady-state universe. Consequently, it must have had a beginning. How far back it began can only be estimated. Carbon dating can be used to assess the age of fossils. It can be assumed that the oldest discovered fossils are the remains of the oldest forms of life. Notwithstanding, the technique of carbon dating relies on some assumptions that may or may not be valid. Consequently, the age that the fossils are thought to be could be enormously wrong. The only things that can be known for sure about life in general is what is and has been studied during the short time since scientific observation began. It is thus observed that both simple and complex forms of life coexist. They live together within the Earth's bio­sphere at the same time to form a global interactive web of life that some people personify as Gaia. For Gaia to function, life cannot simply evolve from simple to complex. Each life-form must stay within certain limits of adaptation. If it didn't, it would no longer be able to fulfil its vital role within the Gaian web. Would this intricate web of life continue to function sustainably if the human life-form were suddenly and completely removed from it? Scientists are human beings. Thus, a world without human life has never been scientifically observed. It is reasonable to suppose that a humanless world existed in the past. However, to suddenly remove the human from the Gaian web now would be somewhat like suddenly removing the telephone or the internal combustion engine. We have grown to depend on them. The global economy, as we know it, would undoubtedly collapse. There is doubt whether a Gaian system could function sustainably without an interactive mix of genuses of different complexity. Such a monolithic system is not likely to be resilient to change. But suppose there was a time in the past when Gaia comprised nothing more than a vast population of amoebas. Then suppose that a new genus emerges, for example, frogs. I don't think frogs eat amoebas, but for the purpose of illustration, suppose they do. There are 3 possibilities as to what could take place. Firstly, the amoeba could develop skills that enabled it to escape the frog with ease. All the frogs would then die of starvation. The second possibility is what I call the Genghis Kahn syndrome. The frogs easily catch and eat the amoebas. The frog population increases rapidly. All the amoebas are eaten. The large population of frogs then has nothing to eat. The frogs all die. The third possibility is that the frogs have a moderate ability to catch the amoe­bas. Consequently, they consume amoebas at a rate that is below the amoebas ability to maintain its population at a sustainable level. However, this poss­ibility is only a metastable state. It can easily tip into either of the first two. Within this third (metastable) possibility, there are three other sub-possibilities. The frog population could increase independently of the food supply. Each frog would not thereby be able to acquire enough food to sustain itself. All the frogs would starve to death. The second possibility is that the frogs cannot reproduce fast enough to maintain their population. They thus all die out irrespective of their food supply. The third possibility is where everything is fine. The frogs' rate of reproduction, their ability to catch their prey and their prey's rate of reproduction are all maintained in a finely tuned balance. However, this latter possibility is a metastable state that is even more susceptible to being tipped into one of the other possibilities. The upshot is that for this one and only precariously metastable state to be sustained, active control mechanisms are absolutely necessary. It is like the latest generation of fighter aircraft. They cannot glide. They need constant live inter­active adjustment to their control surfaces in order to maintain stable flight. Likewise, our frog must be equipped with, among other things, automatic fecundity control. This must be driven by conditions in the frog's Gaian niche such as the relative amoeba population per frog. But the frog's niche conditions do not tell the frog's fecundity controller how to respond to them. This must be built into the programming of the frog's cells. It must include knowledge about the frog's Gaian niche and the nature of its prey. In the Gain system of today, with its vast plethora of genuses including the human, Gaix (the internal programming of the cells of each genus) must necessarily be correspondingly more complicated. It must include prior knowledge on how to respond sustainably to a much more complex and more interactive Gain environ­ment. For Gaix to work, it must contain all the structural and procedural information necessary to generate all the diverse life-forms of Gaia long before they existed. All this coding, as I have discussed above, could not have been an inevitable fall-out from the resident forces of nature. 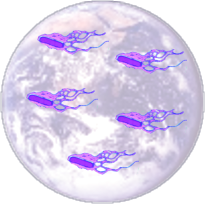 Consequently, Gaix could not other than have been written by programmers, who, at the time they wrote it, had full fore­knowledge of their intention to generate the Gaian system that exists today on Planet Earth. The problem is that we know nothing about the nature and identity of these programmers. Perhaps the source code for Gaix exists somewhere with a header section identifying its authors. However, so far, as far as I know, no human biologist has been able to decipher any such information from the DNA base sequences or any other part of the living cell. So who can these programmers be? Are they God, the creators of all things? Perhaps, before the mists of antiquity, they toiled away designing the Gaian system, the Gaix cellular operating system and its DNA-based command arguments, verifying all its logic and combing all the bugs out of their superlatively complex and immaculate coding. Or were they extra-terrestrial genetic engineers who seeded this planet's biosphere with a Polychaos Dubium type initial cell and then just went on their way? Or did the Initial Cell arrive by chance, having been scattered throughout the universe, along with millions of its peers, to land blindly in an ancient fertile ocean? Or is life itself just the incomprehensible tip of a virtual iceberg that extends into hyper-physical dimensions that are bound to be forever beyond the reach of our senses and scientific instruments? I don't know. So unless or until some tangible information emerges as to their nature and identity, I am happy and contented just to call them X. (Perhaps this is why Gaix ends with an x.) Nevertheless, by studying the detail of the vast functionality embedded within the living cell, perhaps human beings may gain some idea as to the nature, character and intention of Gaix's programmers, even if not their identity. Notwithstanding, there seems to be a glaring anomaly with the idea that the web of life on this planet evolved - or more accurately, developed - entirely under the control of a prescribed program or cellular operating system. And that anomaly is the human being. Physically, the human does not seem well adapted to its terrestrial environment. There are very few places on this planet where it can survive just as it is, without clothing, shelter or additional heat. The variety of food it can eat in the raw is extremely limited and is available in only a few geographic locations. It is also doubtful whether a diet of such limited variety and availability could sustain the basic human lifestyle. Such a diet would at least require a human to graze all day long, leaving it no time in which to think, plan, work and socialise. Consequently, it is very doubtful whether humans could survive on this planet without the knowledge and ability to light fires and cook food. This requires not only the ability to create fire but also the dexterity to control it. It also requires a wide knowledge of what can be cooked and eaten and what cannot. Such knowledge and ability does not seem to be instinctive. It appears to be passed on by inter-generation communication. The passing on of knowledge from generation to generations further requires abstract thought and symbolic language. 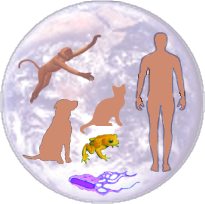 Neither any of this knowledge nor any of these abilities are possessed by any other animal within the Gaian system. Yet it is evident that the human animal, without these additional super-powers, could not live on this planet, let alone dominate it. All animal behaviour comes from instinct, which is genetically hard-wired into the animal's brain. Instinct can be quite complex, adapting an animal's behaviour, within limits, in response to arbitrary changes within its niche environment over successive generations. Nevertheless, the knowledge and abilities, furnished by an animal's Gaix-supplied instinct, cannot be fundamentally altered or extended. Humans also have instinctive behaviour, albeit very limited. However, they also have something additional and fundamentally different. They have the faculty of abstract thought and the ability to use symbolic language to pass on and accumu­late knowledge over generations. The faculty of abstract thought and the resultant ability to manipulate linguistic symbols could possibly have unfolded under Gaix control. Notwithstanding, any instance of a real spoken or written language, plus the original knowledge content it conveyed and preserved, would undoubtedly have had to have been introduced into the human mind deliberately by some external agency. The Zeitgeist had to be initialised. For many people, all this begs the question as to whether human beings really originated on Planet Earth. In other words, were we planted here from somewhere else and somehow adapted to the terrestrial biosphere? Our digestive systems do not seem to be very well equipped for surviving on what the biosphere has to offer without subjecting it to a good deal of artificial processing. We are not exactly built for the climates offered by the vast majority of the planet's surface. On the other hand, the Earth's air and water are ideal for us. This suggests to me that, rather than being a complete alien, the human being is much more likely to be a somewhat ambitious genetically re-engineered adaptation of a specie which was originally indigenous to this planet. The form, size and functionality of my body may well be an inevitable consequence of program-driven evolution, with or without any midway interventive genetic re-engineering. But what about me? What about the sentient consciousness who looks outward into the universe through the eyes and senses of my body? I find the ideological convictions of my inner conscience to be almost completely at odds with the reality of the Gain world within which the body, through which I sense it, is completely immersed. Specifically, the picture of the universe portrayed by mathematics and the pure sciences seems to me to be one of perfection. 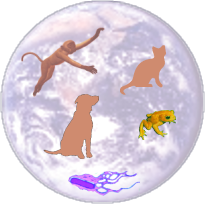 On the other hand, the picture of the world of life, as provided by the life sciences and personal observation, seems to me to be one that is red in tooth and claw. It is a picture of perfection gone slightly wrong. My inherent sense of morality and justice do not rest well with what appear to me to be the more barbarous aspects of nature. Consequently, I see Gaia as having been somewhat perturbed from its ideal state. It is as if somebody has been hacking with Gaix. Notwithstanding, for this to happen, there would have to be an enormous trans­formation (evolution) of the digestive systems of an awful lot of animals. My moral conscience also impels me to prefer a world in which human society is peaceful, just and egalitarian. I am involuntarily abhorred by the present world order of privilege, disparity and deprivation. But the genetic programming, which orchestrated the construction and operation of Gaia, also orchestrated the construction and operation of the human brain. It should not therefore be surprising that human society also is red in tooth and claw. Why, on an individual basis, is the human conscience at odds with Gaia when collectively, as human society, it is not? How can this be? Perhaps it is because human society is a product of Gaian evolution whereas the individual human conscience is not. Perhaps the collective behaviour of human beings is orchestrated by Gaix whereas the volition of an individual human being is not. This suggests to me that whereas the marauding cretin we call human society is indigenous to this planet, the sentient consciousness within each individual is not. He is a stranger in a strange land. For all this, the origin of life remains a mystery. For this reason, evolutionary science must ignore questions about the origin of life and confine itself to examining the origin of species. They can address only how life, once it existed, could have diversified (or not) into the myriad forms we observe in the present world. They must also be careful not to extrapolate ideas and principles outside their observable scopes. 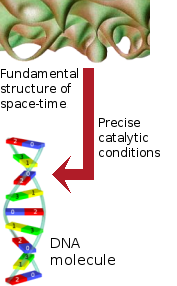 The origin of the physical DNA molecule is the chemical bases and other smaller molecules from which it is composed. But the origin of the DNA code and the mechanism that interprets it is a mystery. The origin of its information content is a mystery. The origin of the paper is known. The origin of the ink is known. But the origin of the words is a mystery. The origin of the language in which the words are written is a mystery. But above all, the origin of what they say is a mystery.